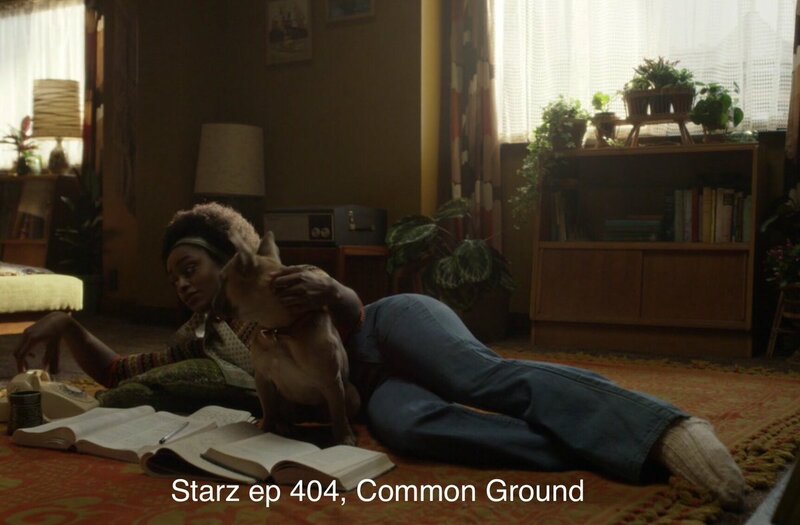 Because of how few black characters there were in the past 3 episodes of Outlander Season 4, I have decided to put my quick recaps for these episodes into one post. I knew that this quick recap series would be short and sweet; as IMDb had the actors for Ulysses, Phaedre, and Gayle (Colin McFarlane, Natalie Simpson, and Simona Brown respectively) listed in less than half of the thirteen episodes for season four. It was expected and I’m not disappointed because I like what I’ve seen from the characters so far. In episode three we only get a glimpse of Ulysses telling Mistress Jocasta that Jaime was bidding her farewell. Besides that, we see a few well-dressed people of color in the airport back in the 1970s with Brianna and Roger. The beautiful Simona Brown made her first Outlander appearance in this episode. Gayle is Brianna’s roommate and friend. We first see the stylish young woman when Brianna is on the phone with Roger. Later on Gayle answers the phone and lets Roger know that Brianna has gone to visit her mother. In the episode titled ‘Savages’, there were no appearances by any black characters. I do appreciate Outlander for using Native Americans to play their Native characters. Have you been watching the new season of Outlander?